Musical creativity is not always something you can just turn on like a tap, so software developers are working on tools that can provide compositional inspiration. One such is Scaler, which Plugin Boutique describe as a “creative chord composer”. Scaler’s musical assistance comes in the form of a plug-in that supports VST, AU and AAX hosts, with a succinct PDF manual and helpful prompts built into the user interface that help you get started. The plug-in contains a small selection of internal sounds so you can explore its features without recall to any other tools. However, within most DAWs, you can route the MIDI output from Scaler to another MIDI track, where you might have a more sophisticated virtual instrument sound engine inserted. In essence, the plug-in is built around a database of scales, modes and chords. A ‘detect’ mode lets you play in any combination of individual notes or chords, whereupon Scaler will first identify the chords you’ve played, and then show you which key/scale/mode/chord combinations they best fit into. MIDI input can come from your own ‘live’ keyboard playing or from a MIDI clip on Scaler’s host track. Once Scaler has completed its detection process, the most appropriate matches are ‘scored’ for both notes and chords. Perfect matches are often found — sometimes more than one — but, equally, you will get suggestions where a particular key/scale/mode combination fits except for perhaps one note or a chord or two. That’s not always musically ‘wrong’, but might simply reflect how harmonically complex the original MIDI performance was. Oh, and Scaler can do complex when it comes to chord detection; those with a love of jazz chords are not going to find it lacking on that front. When you select a key/scale/mode combination, Scaler then does its final, impressive trick: it allows you to explore the full range of chords that fit within the selected key/scale/mode. This includes options to trigger full chords from single MIDI Notes — including sending the triggered chords to a further virtual instrument — assemble and test out chord sequences, and then export those chord sequences to a MIDI track in your host DAW/sequencer. And that’s where the help ends: writing suitable bass or melody lines to weave across your (possibly complex) chord sequences from those notes is entirely up to you. Even so, given the price, Scaler offers considerable potential for composers looking to break out of a rut. Usefully, Scaler’s interface can be, well, scaled to suit your available screen space. By default, the GUI is divided up into five main sections. The top strip gives you access to global settings, the useful help system and the small selection of built-in sounds. However, the key element is the real-time display of both MIDI Note and chord recognition arriving at Scaler’s input. The upper third of the UI is dominated by the keyboard display and the Detect panel. When you engage the Detect button, the keyboard graphic will highlight the incoming MIDI keys. If you then press the Start button, any subsequent MIDI input is analysed by Scaler and you will see both notes and chords recognised by the plug-in displayed within the panel beneath the keyboard. However, if you don’t wish to start with your own MIDI input, the Scales, Songs and Artists buttons provide an impressive collection of presets for you to explore, each featuring a collection of pre-selected chords. The Artist selection includes contributions from some very well-known names such as Carl Cox, Josh Abrahams and MJ Cole. While many of these presets make excellent and accessible starting points for developing new song ideas, it’s worth noting that not all of these presets are built from chord sets that ‘fit’ perfectly into a single key/scale combination. That’s particularly interesting with some of the Artist presets and, while there are lots of popular songs that modulate between keys, these more experimental chord sets might prove quite challenging to use for those without at least some awareness of music theory. Once you have either completed the detection phase, or selected a preset, the key/scale/mode results are then displayed across the middle section of the interface. A list of detected key/scale/mode possibilities is shown, with an indication of the closeness of the fit to your note/chord input and some suggested musical styles the specific mode is associated with. Closest matches are shown at the top of the list and you can scroll through others as required. After detection is complete, Scaler offers you a list of key/scale/mode options that most closely match the detected MIDI notes/chords. A further list of the chords within the currently selected key/scale/mode combination is shown beneath the scales list, and buttons allow you to switch between displaying the basic diatonic chords or chord variations and voicing alternatives for each of the notes of the scale. When the Chord Variations button is selected, you can then pick any of the notes within the scale and show chord variations with that root note. This can be an extensive (scrollable) list that I’m sure jazz aficionados will enjoy. In addition, when in Chord Variations mode, you also get a useful panel on the right that provides both basic information about the chord and suggests which other chords it might substitute for. Again, this is an interesting push to experiment with your chord sequences. You can also explore chord variations and voicings for all the ‘in key’ chords. The final panel at the bottom of the UI provides two banks of eight slots, into which you can drag and drop chords either from the topmost detection section or the middle key/scale section of the display. This sequence of chords can then be triggered with the Play button; it’s somewhat mechanical-sounding, but lets you audition the transitions between each chord to evaluate their musicality. Each of the 16 slots allows you to adjust the octave the chord is played back at and the inversion used, both very useful features in fine-tuning the flow of the chord sequence. In principle, Scaler’s chord triggering process is very similar in basic operation to features such as Cubase’s Chord Pads or Logic’s Chord Triggers, but Scaler’s USP is the ‘advice’ it offers you in assembling your family of chords in the first place. Operation is very intuitive, and Scaler can guide you as far as you wish to go in terms of chord selections; pretty much every session I had with it got me exploring chord choices that would not usually have fallen under my fingers. Given the relatively low cost of the plug-in, I’d happily argue that’s enough to justify to price of entry on its own. However, Cubase also offers a feature called the Chord Assistant, which has a different approach but a similar intent. The Chord Assistant can be combined with the Chord Pad system to achieve the same sort of end results; but, with all these features packed into a single plug-in window, Scaler is more intuitive and slicker to use. As outlined in the ‘Alternatives’ box, there are also other third-party options. Perhaps the most interesting of these is Captain Chords by Mixed In Key, which was reviewed in SOS last month. The Captain Suite, of which it is a part, perhaps offers a wider feature set, including help for writing melodies and bass lines, for example, but at the time of writing, only Live, Logic and FL Studio are supported. Just as we were going to press with the review, Plugin Boutique supplied me with the v1.5 update to Scaler. I only had a brief opportunity to explore, but this adds a number of additional options including a new UI skin, some very nice additional chord set presets, additional internal sounds, simple arpeggiator and strumming options for chord playback, and the option to toggle the default piano keyboard display to a guitar fretboard. Chord progressions can now also have 32 steps rather than just 16. However, perhaps the most useful new feature is the introduction of a Scale Lock, so that any individual melodic notes played beyond the chord trigger zone are automatically corrected if they lie outside the currently selected scale. Scaler v1.5 should be available by the time you read this. If I was feeling greedy for features, it would be nice to see the addition of some sort of mechanism for modulating between keys. For example, it would be great if you could define two separate chord sequences and Scaler could suggest appropriate linking sequences or pivot chords. Purists may be uncomfortable with tools like this that allow technically proficient music to be generated by ‘non-musicians’, but this particular genie has been out of the bottle for a very long time, and it’s not going back in any time soon. Scaler will appeal to those who see themselves as ‘music producers’ rather than ‘musicians’ and, as long as it results in some great tracks being made, I suspect Plugin Boutique will consider it a job well done. I’ll leave the philosophical debate to better minds than mine but, from a personal point of view, Scaler is one more of the countless tools that technology now provides me with to improve the music that I create. And at this modest price, I suspect it’ll find its way into the armoury of many other music producers, whether they have conventional musical skills or not. Many DAWs and sequencers now incorporate music theory/chord trigger features, while third-party options include AutoTheory Pro by Mozaic (reviewed in the January 2015 issue), which provides both chord and melody advice. Studiolinked’s Chord Guru doesn’t offer an equivalent of Scaler’s detect feature, but can automatically generate chord sequences based upon a specific key/scale combination. InstaChord by WA Productions adds some interesting performance triggering options such as strum directions to a guided chord selection process, but the most obvious competitor for Scaler is Captain Chords by Mixed In Key, as mentioned in the main text. Scaler needs to be configured slightly differently depending on the host DAW. In Cubase, this involves simply creating a new Instrument track and selecting Scaler as the VSTi to be used on the track. Any MIDI input, or chords generated by Scaler, can then be monitored via one of the four built-in sounds. Alternatively, by setting Scaler as the MIDI input to a second VSTi set up on a further Cubase Instrument track, with both tracks selected and record-enabled, Scaler’s output will be played by the second VSTi. I also gave Scaler a brief run out with Logic Pro X. Under AU, things are slightly different but, if anything, it is even easier to get Scaler to play back through another virtual instrument: the plug-in is also provided as an AU MIDI FX plug-in called Scaler Control, which is simply installed on the appropriate instrument track. Once you have a selection of chords you like, you can either do a simple MIDI export or engage the Bind MIDI option and use your MIDI keyboard to generate a chord performance based upon single-finger triggers. 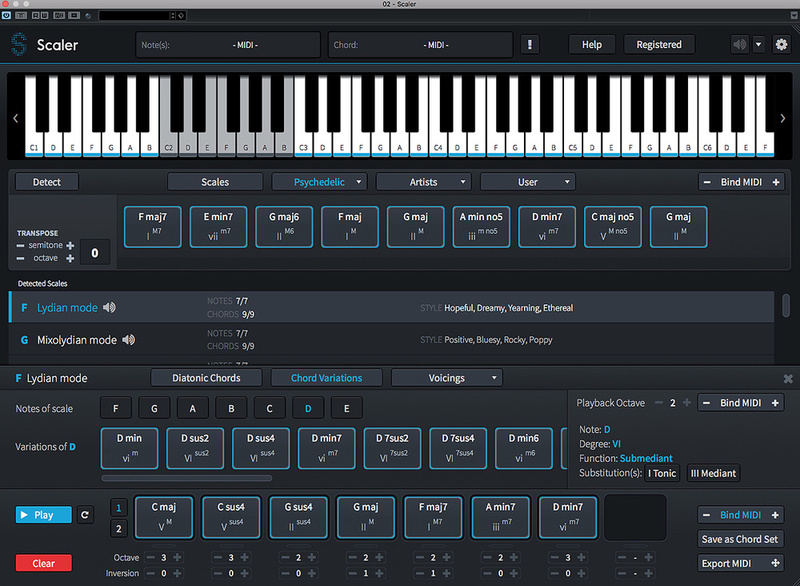 Once you have assembled a chord progression within Scaler’s play zone, you can click on the Export MIDI button to drag and drop that sequence to a MIDI track within your host. This worked well enough, but by default, all you get is a quarter-note sustained version of each chord within the sequence: not the most inspiring ‘performance’ of the chords. You can, of course, then get busy with your MIDI editor, but an easier way to create a performance based on your selection of chords is to engage one of the Bind MIDI buttons. These link any further input from your MIDI keyboard to the relevant section of the interface. Any chords within the various chord slots can then be triggered by a single white key starting from C2. These chord triggers are velocity-sensitive, so you can conjure a decent amount of expression from them. Beyond the number of used chord slots, other MIDI Notes just play their usual single note, so if you have the desire and the keyboard skills, you can play both chords and melody at the same time. Within Cubase, if you enter record mode on the MIDI track that is receiving Scaler’s MIDI output, any chords or melody notes triggered from a bound zone get recorded, this giving a much more performance-orientated way of generating a MIDI chord sequence than drag and drop. Very useful for expanding your creative chord sequence construction skills. The option to modulate between key/scale combinations would be a nice addition. Scaler will undoubtedly appeal to those who are stuck in a compositional rut and, given the price, is accessibly to almost anyone. 2 weeks 12 hours ago.